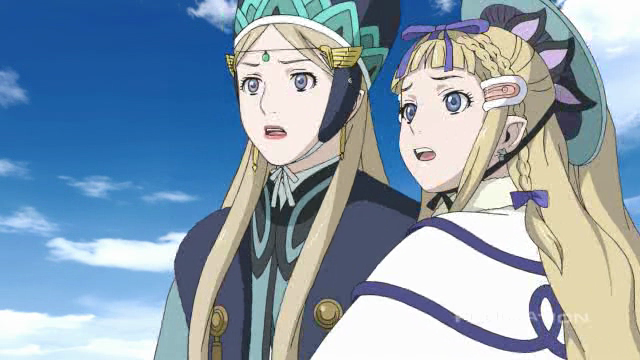 Last Exile: Fam of the Silver Wing 1 ~ I can almost grab the clouds! Fam and Giselle lead a pirate attack against some sky ships. The sequel to Last Exile, Last Exile: Ginyoku no Fam (Fam of the silver wing), hereafter, Fam has premiered. It is a steampunk adventure tale. Two young women fly through the skies as part of a pirate group, and have an adventure with princesses and stuff. Scamp has already commented on how this latest installment seems lighter in tone than the original. I agree, and I also agree that Last Exile supplies something that recent anime hasn’t delivered. Old school anime used to be full of Space Opera: Science Fiction series about great civilizations in conflict. Shows like Harlock, Banner of the Stars, and Legend of the Galactic Heroes were big adventure tales, with extended battle sequences. Most recent Science Fiction in anime is smaller in scope (like Steins;Gate, an extreme example that focuses on a single invention, or No. 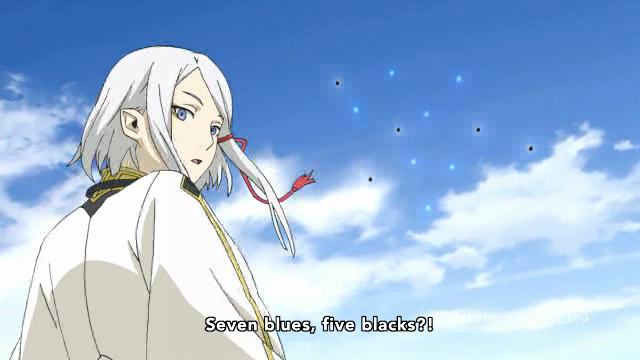 6, and Guilty Crown that look at a single civilization that is at war with itself). 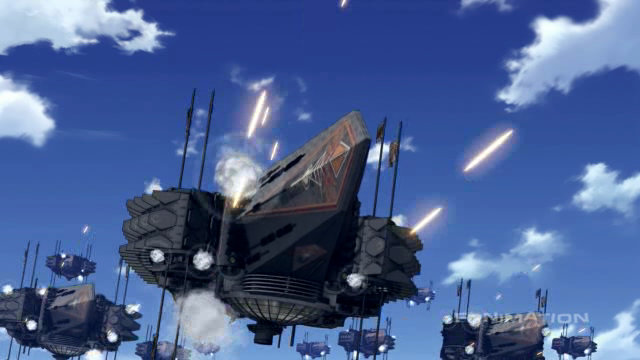 The Last Exile franchise bucks that trend, by showing battles at grand scales like classic Science Fiction anime, like Macross used to deliver, but with a steampunk twist. Here the fleets are not starships, but sky ships. Princesses of Turan: Liliana and Milia Veich. So that we may receive their great bounty. Premier Luscinia Hafez of the Ades Federation. The evil dude. The treacherous Ades Federation pretend to agree to participate in Peace talks, but use the opportunity to launch a sneak attack on Turan. Ades Federation warships open fire. Steampunk aesthetic. Clunky machinery alongside curiously advanced flying machines. Dios, a mysterious young man who sides with the pirates. They already have hinted that Dios is a special person to the plot, because of a couple of oddities, including a flashback in which someone who looks like an older Dios assists princess Liliana as a young girl, and what appeared to be a spaceship entering the atmosphere, that only he seems to be aware of. This show is off to a pretty good start. 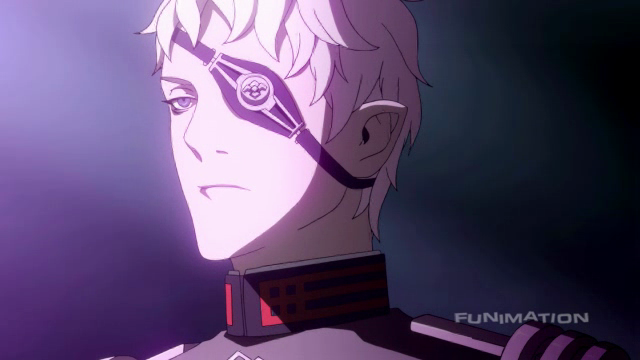 The original Last Exile had an edge that Fam lacks, because it dwelled on the sad realities of war, as seen through the eyes of the pawns manipulated by the battlefield strategists. Regardless, I’m looking forward to more of Fam. It is just too much fun to watch pirates soaring through the skies, and huge flotilla’s of sky ships battle each other. since I didn’t watch the original, i have no idea that Dio is a he and he might be the most interesting character so far, aside from Hafiz who looks so freaking delectable. Why does bad guys are always so delicious? I’m not qualified to answer that question. If I were to guess, I would say that bad boys (and bad girls) have an air of confidence that many good boys (good girls) lack. There’s probably more to it than that, maybe they look dangerous, and there is a thrill on the part of the beholder that there is some personal danger if one were to get involved with them. I actually think I was more captivated by this opener episode than the opening to the first season, but that also might be because I haven’t watched the first season in a while. Anyways, the presence of Dio and the “Exile” ship towards the beginning already has me speculating on where this new setting might be. It;s probably too early to already be speculating, so I won’t say much more. But I do like the intro to this new second season, it had a nice blend of entertaining antics with some serious tactics. 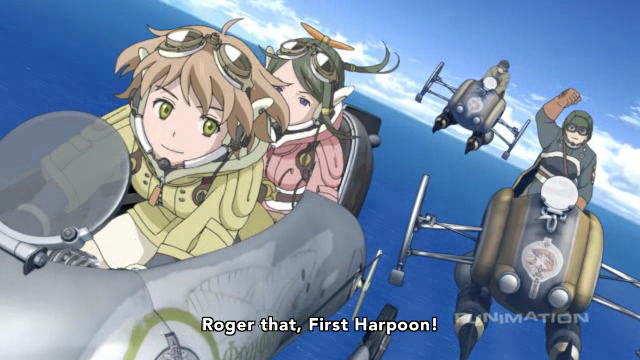 It’s been a while since I watched the original Last Exile, as well. I’m hoping they do it justice. I was searching for that one word to describe a show like Last Exile, things like Harry Potter or the Foundation series, and I got it – it’s a space opera. Fam’s really my first anime foray into the genre – you’re right, I would’ve expected far more of these, but there’s been a strange lull ever since I started watching anime. It’ll definitely be interesting to see what they do with it. Will they revive the genre altogether, or will it stay a niche? 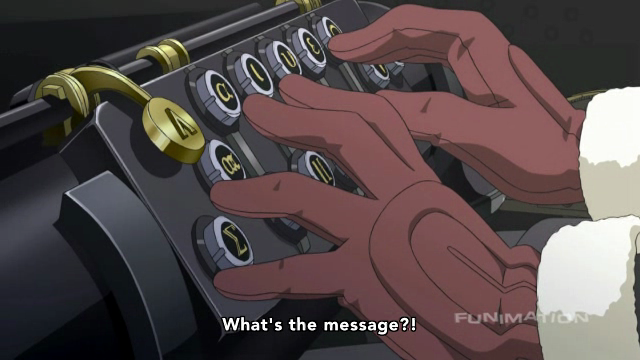 Yeah, there used to be a lot of space operas in anime. In fact, there was a time when anime was known as primarily science fiction. As a kid I watched Star Blazers (AKA Space Battleship Yamato), and there are so many others in which, not only is there this big adventure, but the setting has a huge scale — pitting galactic empires against each other.